This has been a running theme for the B2B Marketing Forum for as long as I can remember. 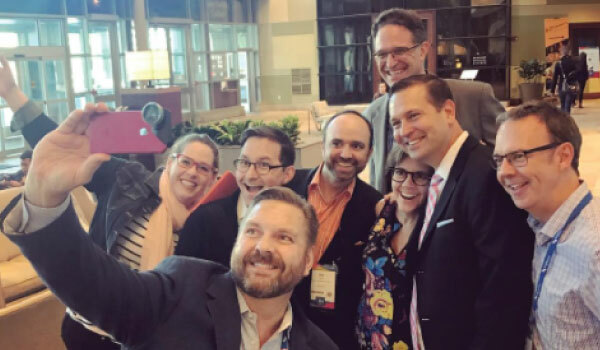 Because the conference is capped at around 1,000 attendees, you actually have the opportunity to run into some familiar faces during the conference. Even if you traveled to the event with members of your own team, it’s important to make the effort to meet new people, “your people”. I’ve been lucky to meet some really amazing people at conferences and continue to be in contact with many of them to this day. We were fortunate to have a team at MPB2B that included myself, Lee Odden, Alexis Hall and Dan Rasmussen. This is a theme that resonates very well with us as we are constantly looking to add new members to our squad at TopRank Marketing in the form of new team members, industry influencers and prospective clients. It doesn’t matter if you are an introvert or an extrovert, there will be situations that push you outside of your comfort zone. It could be walking up and starting a conversation with someone you’ve never met, interviewing one of your marketing heros, or for me, speaking on stage at my favorite conference to a room full of smart marketers. Often, once you do make the effort to step outside of your comfort zone you quickly find that you’re actually having fun and wish you would have taken strides sooner. These two challenges posed by Ann Handley led our team to push ourselves at this conference and align very well with some of our core values. Below is a recap of how we found our squad, went outside our comfort zones and learned as much as we could in an action packed three days. Marketing events present a great opportunity to spend time with the marketers that you love and respect the most. We were fortunate that many of these people were at MPB2B last week. The first night we were lucky enough to spend some time with our squad from LinkedIn Marketing Solutions (who also happen to be a TopRank Marketing client). This group of marketers are some of the most talented and driven people I know. On night two, TopRank Marketing hosted a VIP event that included some of our amazing clients, friends and top influencers at the conference. Thank you everyone for taking the time out of your slammed schedules to share some drinks, eats and conversation with our team! Even though B2B marketers have begun to explore influencer marketing further in recent years, they’re still struggling to prove the ROI of these efforts. 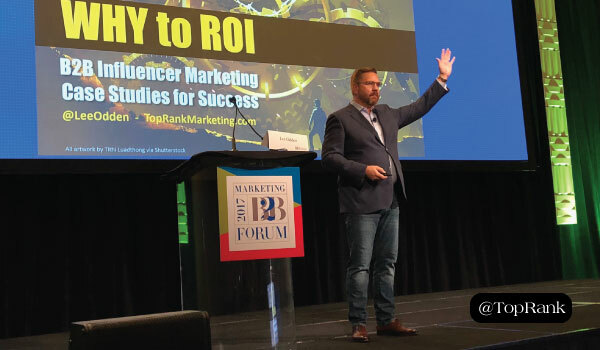 In his session, TopRank Marketing’s Lee Odden shared 5 essential steps for driving ROI with B2B influencer marketing. While the majority of marketers believe that LinkedIn is THE social media channel for business, many are struggling to implement a LinkedIn strategy that garners results. These takeaways from LinkedIn’s Alex Rynne and HubSpot’s Chris Wilson will help you get closer to success. If You Only Had $1k to Invest in Content Marketing, How Would You Spend it? Limited budget, time and resources are a struggle that all content marketers face, no matter the size of their organization. In his presentation, GE Digital’s Chris Moody shared quick tips for advancing your content as well as a breakdown for how a limited budget of $1k could be spent for maximum impact. One of the top objectives for many brands today is to find a way to get audiences to binge on their content. But, creating binge-worthy content takes effort. 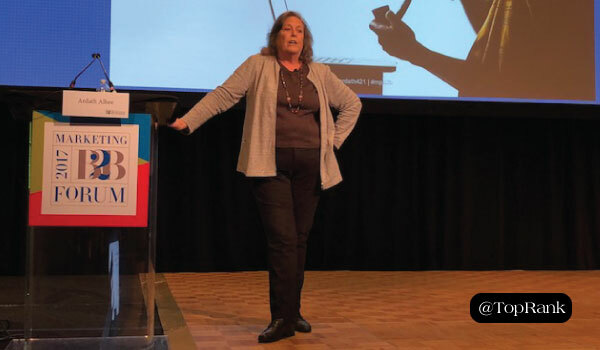 See Ardath Albee’s top tips for creating content sure to keep your audience coming back for more. Marketing activities that aren’t tied to results make it difficult to prove value. BrightFunnel’s Dayna Rothman shows how marketers can turn the buyer journey into a science by properly leveraging data and analytics. In addition to his session covered above, Lee also participated in a panel about the convergence of ABM and Content Marketing. This panel provided great insights on how brands can reprogram organizational tactics to create a more focused, hyper-personalized approach to ABM. 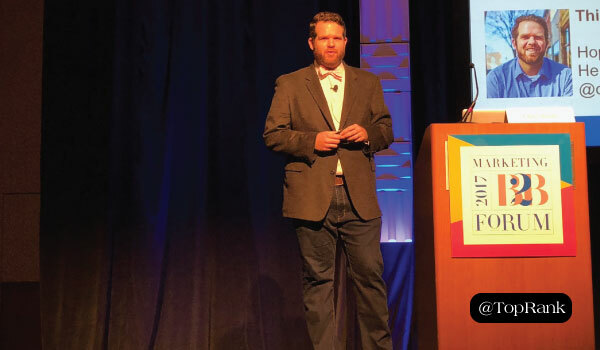 On the final day of the conference, I took the stage for the first time at MPB2B to discuss scrappy B2B creativity hacks with my panelists Nick Westergaard and Andy Hunt. As this was the last session on the last day of the conference, we decided to make our session interactive and answer the audience’s most burning questions about B2B creativity. 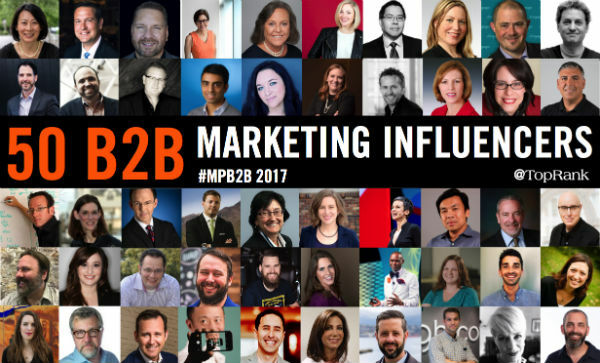 Who are the 50 Top B2B Marketing Influencers From MPB2B? While at the B2B Marketing Forum, Dan Rasmussen and I had the opportunity to interview seven leading marketing experts on everything from their journey into content marketing, to what they predict as the future for content marketers. Subscribe to our blog today to get first-access to this exciting new interview series! Thanks for an Action-Packed Event! Thank you to Ann and the entire team at MarketingProfs for putting on a first-class event. We can’t wait to see what next year’s conference in San Francisco holds! If you were lucky enough to attend this great event, what was your top takeaway? 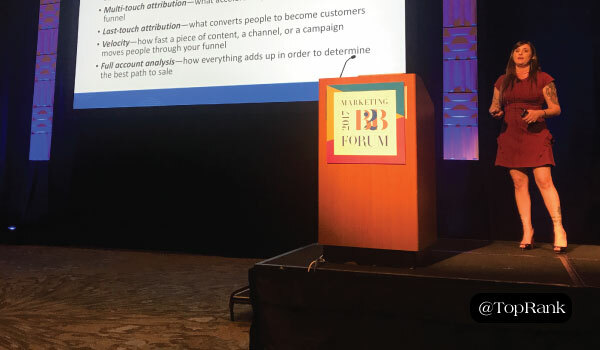 The post Making B2B Marketing Gold: A Look Back at MarketingProfs B2B Marketing Forum #MPB2B appeared first on Online Marketing Blog – TopRank®.